Empty Shell by Ashley Fontainne is another title I should not have started reading at bed time. Once again, as with Accountable to None, Zero Balance and Adjusting Journal Entries, I lost too much sleep. I was introduced to Melody and Jack and recognized the tell-tale signs that their marriage wasn't as strong as it could have been. They had tried for so many years to have children but never succeeded. Unbeknownst to Jack, his wife carried a secret she had buried which played a part in the downward spiral of their marriage - a lesson learned too late. Not bothering to go back to Amazon and read the synopsis of the story, I anticipated reading about a marriage falling apart and wondering how the story would end. Was I ever in for a surprise! Empty Shell may not be a thriller as the Eviscerating the Snake Trilogy was but it sure had its share of crime and suspense between the pages. From the time Melody left home to head to work and walked into her employer's office, her life would never be the same. The events which followed would make anyone's head spin. Her husband being accused of murder was only the beginning of what was to come. Already struggling in her faith, Melody felt lost, alone - an empty shell of what she used to be as she fought to determine the truth, to clear her husband's name. There were so many things going on in the lives of various characters - one man who controlled the actions of so many others that anything was possible. People died whom I thought would have lived and, just as I wondered if justice would ever be served for the criminal actions which had taken place, it was served up on an unexpected plate. 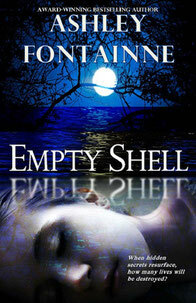 Empty Shell is as much of a page turner as other titles I've read by Ashley Fontainne. It's a mystery/suspense story with Christian overtones and I'd invite you to check it out right here on Amazon.